Our charges are per night - arrivals at say 2.00 pm are welcome to fish until 2.00 pm on the day of departure. Guests are encouraged to arrange itineraries to maximise angling hours. Hours lost because of late arrival or early departure are not compensable. A stay of four or five nights is recommended if you wish to enjoy fully the experiences that are exclusive to London Lakes. London Lakes Lodge has no single room supplement charge. Single angling visitors are guaranteed one person to a room occupancy. London Lakes Lodge (5 x twin share rooms) is available by special arrangement for $2400 per night. The farmhouse (4 x twin share rooms) costs $600 per night for two people or $1000 per night for groups. A London Lakes guide must accompany all fishing - our rate per 1 or 2 anglers is $500. These rates cover full access to the fishery and nature reserve, fishing gear, tuition and transit on location. Full catering can be arranged at additional cost. Day fishing access at $200 per angler plus guiding also is possible. CANCELLATIONS: Cancellation 0-60 days prior to reservation date will result in loss of deposit. Final payment is required upon departure. Please bring credit card or cheque book. We are delighted to answer questions regarding London Lakes or to tailor a package to suit your needs. For any inquiries about rates and availability please contact us. 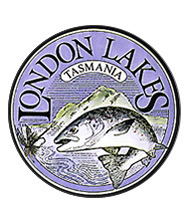 London Lakes are pleased to recommend accommodation and fishing destinations throughout Tasmania and the Australian mainland. The London Lakes brochure and video can be supplied to specialist fly fishing Travel Consultants on request. Copies of the book, "Australia’s Best Trout Flies," are also available. 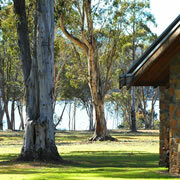 A range of fishing gear, local flies and other accessories can be purchased at the Lodge. A fully accredited guide must accompany all fishing. This will ensure your safety, provide valuable education and ensure that you make the most of your fishing experience. We look forward to sharing our secluded retreat with you. Remember - "When fly fishing downunder at London Lakes, you will be on top of the world!"